Very sharp flattened parallel growth of quartz crystals that are transparent, very bright and with a neatly visible "faden" growth that crosses it tip to tip. 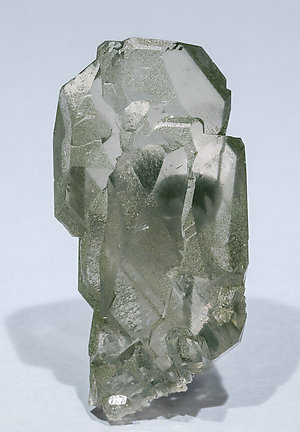 With minor green inclusions, probably of Chlorite. Parallel growth of doubly terminated crystals with a very evident “faden”. 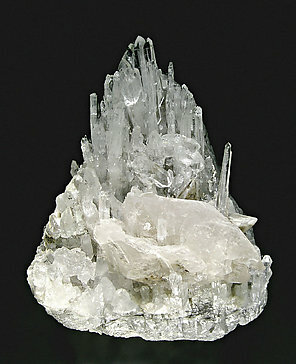 On the base of the piece there is a snowy white crystal of adularia, very bright. The label has the note: Com (comprado / acquired) Sulzbach. Zürich 1947. A fan of Quartz crystals. With them there are small crystals of Epidote. 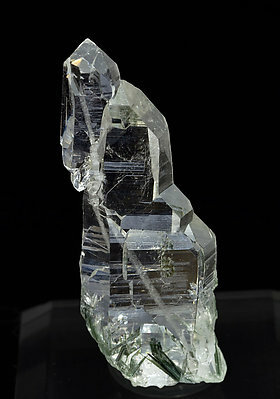 In fact the structure is very interesting, it is a 'faden' Quartz that has suffered some form of stretching. 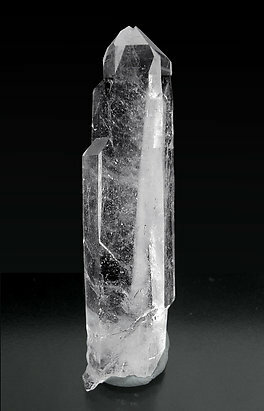 The result is that one can see a clearly curved crystal near the base. It comes from Morocco, but looks alpine. Apparently being a single crystal, the growth shows different spread terminations all along the prism. In the interior a very thin, as a needle, “faden” is formed. 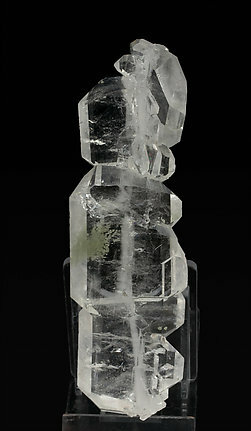 Group of elongated, clear and shiny crystals, with "faden" growths in them. 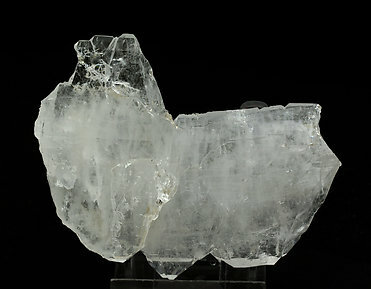 Very unusual distorted Quartz, extra-flat and apparently with broken areas, although "in person" it is clear that all faces are complete and undamaged. 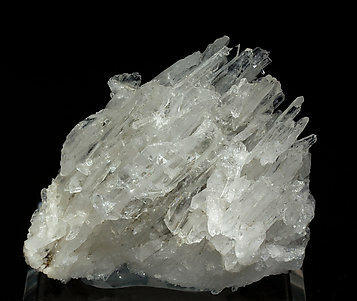 Group of extraordinarily elongated, clear and shiny crystals, with "faden" growths in them. 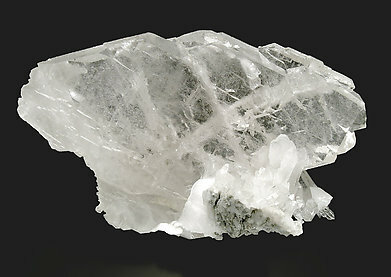 On the matrix, a big rough crystal of Calcite stands out. Doubly terminated floater crystal with a closed “faden” and very well defined parallel growths. The sample, very transparent, has a deep and uniform smoky color. A French classic from the Christophe Marot collection (cat. nr. C8-6), on whose label, that we’ll send with the sample, it is noted that it was acquired in 2008 from Denis Boël. 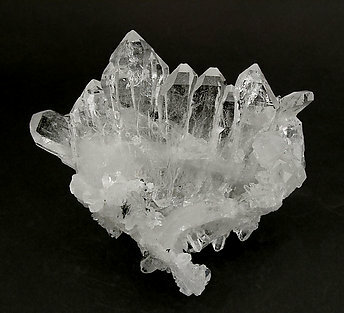 Multiple parallel growth of very flattened crystals progressively turning to the right and crossed by a sharp chloritized ”faden” and contrasting with another group of different shape, very elongated. Very original. The specimen is from the Denis Boël collection. We will send to the customer the collector’s label. Echeloned uniaxial growth of Quartz crystals, perfectly clear and bright and with a very notable "faden". 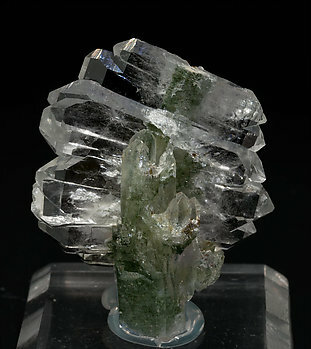 The base is rich with fine green acicular inclusions, probably Ferroactinolite.